We believe in giving our clients the best holiday experience, according to individual needs and budgets. Our consultants have extensive knowledge and experience, having visited all of the various destinations and many of the Lodges in Hluhluwe uMfolozi Reserve. We are an independent booking agency. You pay the same as if you were to book everything yourself directly – and we take all the fuss and anxiety out of your arrangements by providing local knowledge! We will not only plan and book your South African holiday for you, this can include almost any destination in Southern Africa where we have a preferred venue, since our expertise extends across the whole of South Africa as well as into Swaziland, Botswana, Namibia, Zimbabwe, Kenya and Tanzania. Far and Wild Safaris cc is a registered Close Corporation established and registered in 1993, staffed by an enthusiastic, knowledgeable and responsible team. We are a National Member of SATSA # 560, Tourism KwaZulu-Natal, Durban Africa and the 'Battlefields Route'. All necessary industry criteria have been met with attention to our client's requirements with their satisfaction, a priority. Close association with certain Lodges, travel agents and other service providers has been established over the years which ensures value for money and a competitive edge. A reservations office based in the centre of Durban is on line, with all reservations made and recorded by e-mail. Office hours 08h00 to 17h00 Monday to Friday. Closed on Public Holidays. 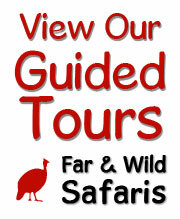 Far and Wild Safaris cc operates with the highest integrity within all aspects of its business ethic. We are proud of our providing personal attention whilst showing some of the finest South Africa has to offer. Our professional guides will take you to exotic destinations, where your every expectation will be met. From the unique wildlife, culture to our fantastic scenery. Our team facilitates regular safaris from Johannesburg, Durban and Cape Town, into the wild areas of South Africa. We will transport you in a luxury vehicle or mini-bus, throughout the country, to explore this fascinating environment . The emphasis of our safaris is to provide an holistic experience in both the natural and or cultural environments. We utilise the services of SATourism THETA registered specialist tour guides with further input from associates. All with many years of experience in the African bush so that you and your party are able to get the most out of this African experience. 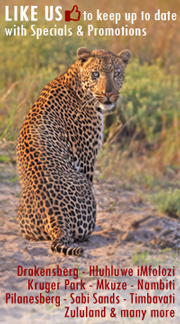 Our guides have expert knowledge of the principal protected areas of the region where we focus our game viewing. We wish to promote ecotourism by bringing together peoples from all walks of life to develop in them a better understanding of themselves and their environmental heritage. To nurture a spirit of adventure whilst respecting our conservation ethics and to provide an enlightening, participatory travel experience to environments both natural and cultural, that contributes to the sustainable use of these environments. Whilst respecting the integrity of the host communities, produces economic opportunities that contribute to the long term conservation of the resource base and reinforces the concept that conservation can bring meaningful benefits. that no liability, expressed or implied, is accepted by Far and Wild Safaris cc or any of its associates or employees for the accuracy, content or use thereof. 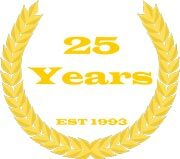 Creating Unique Holiday Experiences for Over 25 Years. Copyright Far & Wild Safaris cc. 2019. Copyright and database rights exists in this publication and all rights are reserved.